Where the tank and drain field is located (exactly)? Who installed it? When did they install it? When was the last time it was pumped or inspected and by what contractor? If the answer to any of these questions is "I don't know" or "unknown", BEWARE! Septic systems require regular maintenance. They cannot be ignored, and a lack of maintenance can result in a very costly repair! 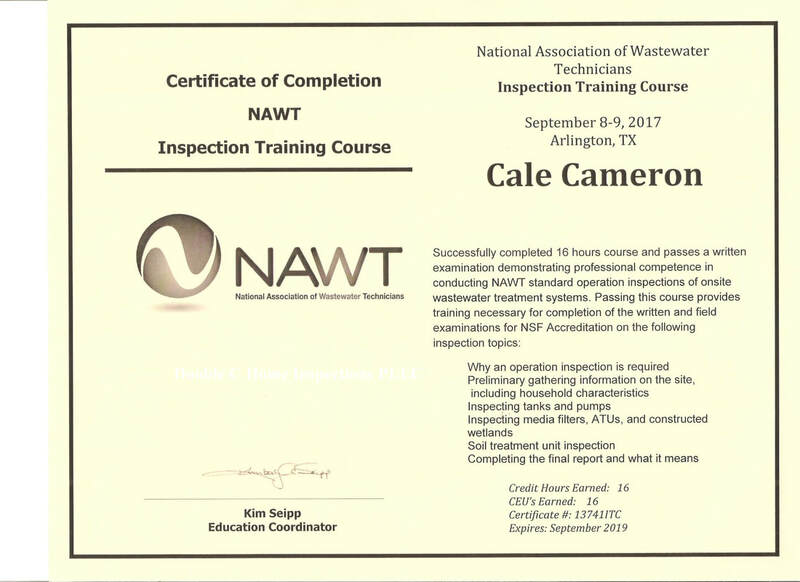 We advocate the use of the best approved methods of collection, transportation, beneficial reuse, and treatment of septage and sanitary waste in compliance with all Federal, State, and Local regulations. We advocate the use of the best cost effective approved technologies available to construct, rehabilitate, and maintain on-site sewage disposal systems, that are environmentally sound. We advocate education of our customers, our employees, and ourselves to better protect the public’s health and the environment. We endeavor to conduct ourselves in a professional manner in order to maintain a proper level of trust with the public, our competitors, and the various regulatory bodies we encounter. We endeavor to provide appropriate credible assistance and input in the rule making process. We endeavor to consider and evaluate the view points of all parties towards the betterment and general well being of the public and our profession. Individually, and as an organization, we endeavor to do all we can to improve all aspects of our industry. 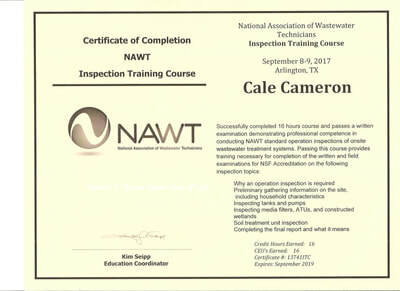 NAWT certification far exceeds the minimum standards for septic inspections required by the Texas Real Estate Commission! The #1 defect I find with septic system inspections relates in some way or another to the lack of maintenance of the septic system on the part of the current or past homeowners. No amount of inspection prowess or knowledge can overcome these roadblocks. If you are planning to purchase a home that claims to have a septic system, BEWARE! Most of the septic inspections I perform fail due to any number of reasons, and a few did not even have an environmentally acceptable system on the property! Contact me to schedule your septic system inspection! I offer a reduced fee when scheduled along with a home inspection!